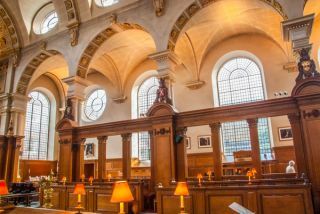 Recently restored to Christopher Wren's design, this is the "church of the press", so named for its use by newspaper reporters from Fleet Street. This is the eighth church in this location, and remains of the other seven, plus Roman pavement, can be seen in the crypt museum. St Brides can claim with some justification to be one of the oldest sites of worship in Britain. Shortly after the Roman invasion of 43 AD they erected a building on the site, and remains of mosaic suggest it was a temple of some kind. In the early 6th century a small stone church was built here by the Irish abbess St Bride, or perhaps by some of her followers. This church was rebuilt and enlarged several times over the next 5 centuries. The church's location, between the City of London and Westminster, made St Bride's in important centre, standing between the centre of government power and the centre of commerce. In 1205 a gathering of major landowners and church officials called the Curia Regis, a forerunner of Parliament, met in St Brides to provide advice to King John on legislation. In 1501 Wynkyn de Worde set up a printing press with moveable type in the churchyard of St Brides. Why choose St Brides for his new printing enterprise? As the centre of London was filled with wealthy merchants, the area outside the city walls became a haven for clergy. And since the clergy were the most literate class of society, and the most likely to buy printed books, De Worde set up his printing business where his major customers lived; in the Fleet Street area between London and Westminster. From those humble beginnings, Fleet Street soon became a literary centre, with poets and playwrights setting up their own presses in nearby churchyards to compete for business. 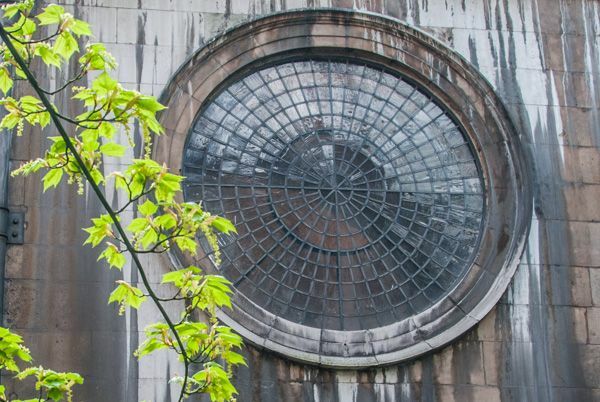 The link between St Brides and print journalism was born; a link that still exists today. as for Wynkyn de Worde, he was buried in St Brides in 1535. In 1585 a child named Virginia Dare was born to a pair of English settlers in North Carolina. The Dare's had been married at St Brides before setting sail to the New World. Near the font is a small bust of the little girls. A much more noticeable reminder of the church's link to the American colonies is the oak reredos, a gift from Edward Winslow, who served as governor of Plymouth, Massachusetts three times. Winslow was a leader of the Mayflower voyage of 1620. His parents were married in the church and young Edward served as a Fleet Street apprentice, so he would have known the church very well. The Great Fire of London hit St Bride's hard. The church actually had its own fire engine, but it was poorly maintained, and would have been of little use in any case against the devastating blaze. The church was completely destroyed, and parish services had to be held at St Paul's Cathedral. 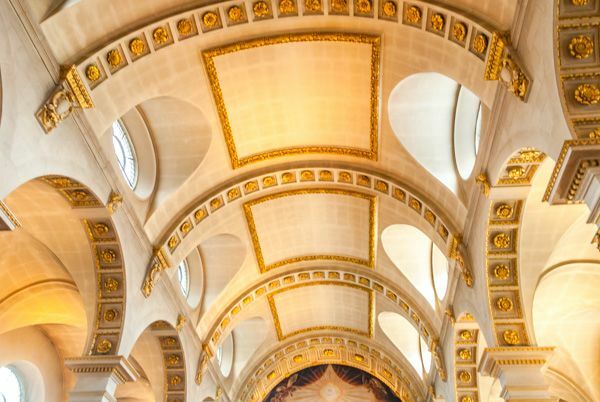 When Sir Christopher Wren was asked to take on the task of rebuilding London's churches, he decided that it was unnecessary to rebuild all 87 of them, as the city's population could not support so many. The churchwardens wined and dined Wren in an attempt to convince him that St Bride's should be one of the lucky ones to be rebuilt. 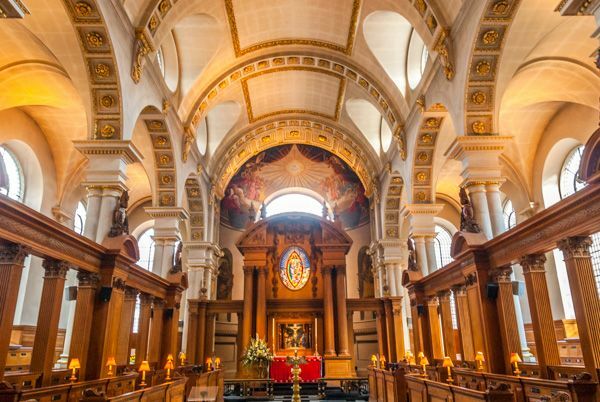 Whether Wren was influenced by the churchwarden's largesse is unknown, but St Brides was one of the first London churches to be rebuilt, reopening in 1675 at a total cost of £11,430 5s. 11d. The distinctive multi-tiered tower, however, was not added until 1703. 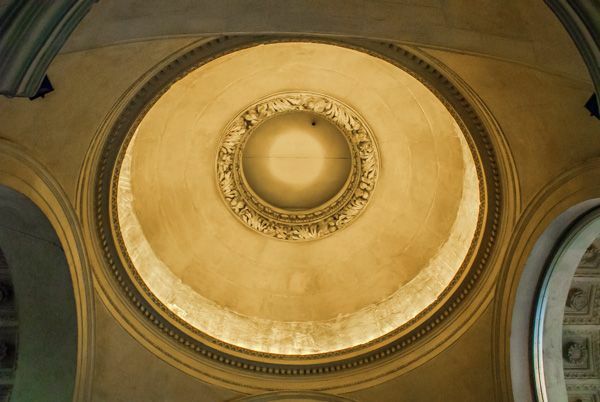 At 234 feet it had the highest steeple built by Wren, and that very height meant it was subject to a lightning strike in 1764. The rebuilt spire is only slightly lower, at 226 feet. 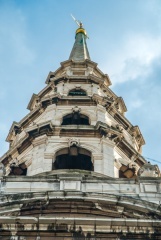 There is a romantic story attached to the steeple of St Brides. The story goes that an apprentice baker named William Rich fell in love with his master's daughter. When he became a master baker in his own right he asked for the young woman's hand in marriage, which her father granted. Rich wanted to create a very special wedding cake to celebrate the marriage, which was to take place at St Brides' church. Casting about for inspiration, he looked up and saw the tiered steeple of the church. The steeple prompted him to create a wedding cake in tiers, each tier smaller than the last. From that romantic inspiration came the traditional tiered wedding cake design used so often today. On 29 December 1940 St Brides was struck by German bombs, and much of the interior was lost. Remarkably, Wren's steeple survived. During work to clear the site for rebuilding, remains of Roman mosaic were found in the cellars. More surprising, perhaps, was the discovery of thousands of skeletons, interred in the crypts after the Great Plague of 1665 and the cholera epidemic of 1854. Well over 7000 skeletons were found. 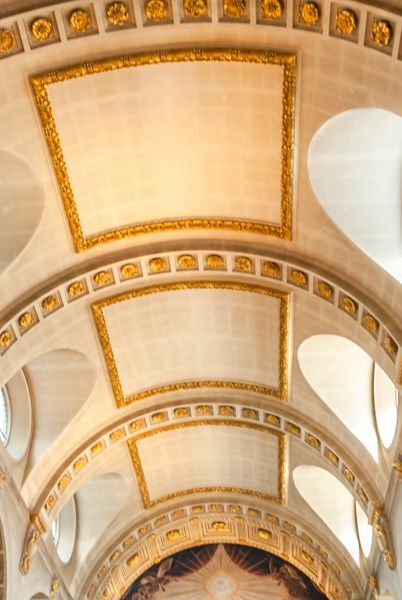 When the church interior was rebuilt, the design followed as closely as possible the style of Wren's design, with the exception of galleries, which were removed. So, though the church interior we see today is not Wren's, it looks very much the same as it did when the church was opened in 1675. The best historic features inside St Brides are in the crypt. In the south east corner is a section of Roman mosaic pavement, suggesting that there was a temple on this spot. In the north east corner is a medieval chapel. The chapel now serves as a memorial to the Harmsworth family and the staff of Associated Newspapers who were killed in the two world wars. In the north east corner of the church is the Journalists' Altar, originally known as the Hostage Altar. During the 5 year period from 1986-1991 when journalist John McCarthy was held hostage in Beirut, candles remained lit at the altar and regular prayer vigils were held on McCarthy's behalf. After McCarthy's release the later became used more generally as a memorial table, dedicated to the memories of journalists and staff who have died in the course of their duties around the world. Diarist Samuel Pepys was baptised in St Brides, and his brother Thomas was buried here.